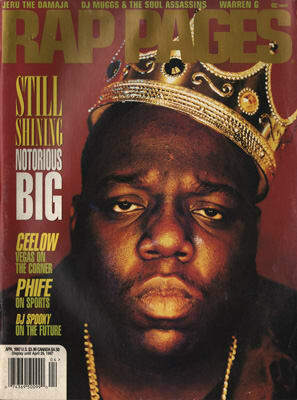 Biggie might have more iconic magazine covers to his name than any other rapper. As a visual presence he was almost as captivating as he was on a record. But it's this later Rap Pages cover that stands out above the rest. So simple, yet so unforgettable. Photographer Barron Clairborne caught the late great veteran in all his glory, "black and ugly as ever," with a tilted crown perched sloppily on his over-sized head. The King Of New York on his throne. You don't even have to crack the pages, his eyes alone tell the story.